The Never Summer Insta/Gator is a fun directional hybrid rocker take on a short fatty that we had a pretty good time on. It did flex a bit too much in the middle in uneven resort runs that took some drive out of the turns but that does make it more fun for a freestyle approach to riding the mountain. Other than a few minor improvements, like changing the top sheet, the 2019 Never Summer Instagator rides very much the same as the past models. Sizing: The 151 felt just right and even though it’s super wide I had a good time with my size 9’s. So did Peter with size 8.5, Jimbo with 10.5-11’s and Zobel with 11’s. That being said we could all go up one size if we wanted a little more board underfoot. Flex: It’s got a fun flex that feels much easier to butter than you would think from a flex in the shop. It breaks easier than you would think in the middle and it’s easy to butter off the tail and easier to butter off the nose. As you get to the tip/tail it get’s stiffer. On Snow Feel: The Never Summer Insta Gator is pretty loose and playful and sometimes is has moments of stability but it wants to spin on you pretty easy when you flat base and one foot. The short fatty design here is fun and if you surf it feels like a pretty dynamic fish that sits on top of the water but also can snap it under a semi-steep lip. It’s not a dynamic super slashy up and down type of surfer like the Maverix but we all preferred the Never Summer Insta/Gator in all conditions except quick turns in the bumpy snow. Edge Hold: Never Summer has pretty good grip and in the few hard patches we found the grip seems to be on par with most NS boards out there. Not the best in hard snow but it can hang. Skidded Turns: Really easy to skid a turn and it’s very forgiving for a ride of this flex. Pretty hard to catch an edge compared to many camber profiles out there. Carving: So this is an off the tail kind of carve and you want to lean back on the tail but if you do it’s pretty fun. It’s not a dynamic rewarding camber style carve or as fun as the 25 but it’s way more fun than we all thought it would be. Speed: It’s super damp in terms of sucking up chatter and not passing it on to your joints but a little loose to be a bomber. The way the board flexes in the middle can prohibit its ability to drive out of the turns. It’s more of a board that likes to turn and slash than bomb. Powder: The 151 Insta/Gator felt like it had more volume and float than the Maverix. It sat on top of the snow like most short fatty’s and it’s definitely a fun way to ride powder like the Optimistic 151 we compared it too. We felt that in good un-tracked powder the Optimistic felt smoother and we all had better lines but as the day got tracked up and we slowed down the Never Summer Insta/Gator started to do better weaving in and out of the turns. Both felt a little slower than the Maverix and other more narrow waist boards. Seems that long and narrow is still better for super tight trees and bumps than short fatty’s. Buttering: Here is the interesting thing about the Never Summer Insta/Gator. It butters super well and compared to many short fatties’s it’s super easy to butter. The softer flex in the middle helps make this fun for buttering around and it’s something most short fatty’s don’t have. Switch: If you compare this to the Proto Type Two or Funslinger then yeah it’s very different and off but as far as tapered directional short fatty’s go it is very doable. Jibbing: You know at first we said nah but the more I thought about the flex and how it broke a bit in the middle this wouldn’t be too bad for jibbing for the type of board it is. Pipe: We didn’t have a pipe up but never liked that short/wide board in there. Maybe someone who air’s out every hit might like it better but I personally never liked the feel going wall to wall with a wider board. Jumps: Nice pop off the tail and it’s great for spinning. For a board of this type, it’s pretty decent though to land switch. . So the Never Summer Insta Gator has a very similar build (other than the camber profile) to the Yes Optimistic and many readers have asked us to compare these two. So we compared the Optimistic 151 I own to this 151 Insta/Gator we had for an extended demo. In the conditions, we tested these boards the Optimistic shined but the more I thought about it the more I came to these conclusions. With the Optimistic carving was more fun, speed/stability was better, edge hold was better and un-tracked powder had a better flow through the line you set. The Never Summer Insta/Gator was more playful/catch free, more buttery, easier to ride in all conditions and especially so in the really uneven snow. So all of us felt like the Optimistic really shined in the conditions we like to ride short/fatty’s the most but we felt the Insta/Gator, while never shining brightly at one thing, did everything well and might be a better solution for those that want to ride a short fatty full time. The Never Summer Insta Gator is more like an all mountain short/fatty that can do a bit of everything. It’s especially good for those that ride all day on weekends and often see lots of uneven snow. It’s also not a bad choice for those who like to butter and incorporate more of a freestyle approach to riding a short fatty. We try to get as many images of the Never Summer Insta Gator, but forgive us if they're not all there. Really good board, I just want to jump in after riding this side by side with the Yes Optimistic. The Instagator has way more flex in the middle which makes it fun for buttering and general playfulness. Carving is off the back foot which is different from traditional camber boards... definitely surfy. The camber profile makes it super spinny, which can be awesome when you’re in the trees or just want a quick turn/transition to switch. The flip side of the spinny camber profile is that it can catch in the middle of the board on hardpack. The Yes optimistic has more traditional camber underfoot and carves like a dream, is quick to turn in moguls/trees, and felt better for the conditions most of us ride 90% of the time vs those deep powder days. I’d rather surf pow on the instagator and ride hardpack up to 8 inches in the optimistic. Both are well-rounded and all around awesome but I just couldn’t get myself to love the camber profile of the instagator on hardback personally. 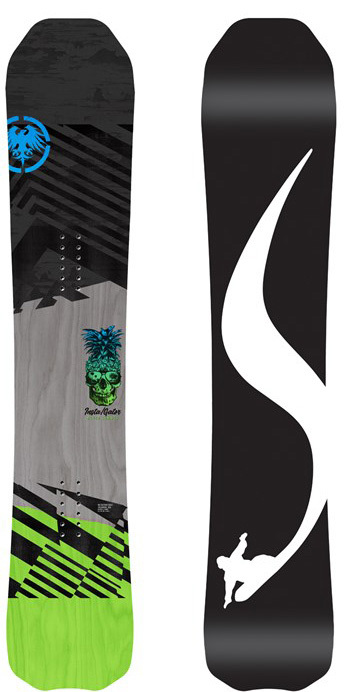 This is a great board for powder or just cruising around the mountain. This is a surprisingly easy board to ride. Catch-free and very forgiving. The width makes it feel really stable at speed. Despite being directional with a huge set back, riding switch works just fine on this board. Bombing down a run and blasting into some powder is great fun. On a regular board you'd be afraid of the nose digging in and tomahawking you. With this board, it surfs on top and just goes like stinik over the powder.